After graduation, I will be moving up to New Jersey to work in the FAA Technical Center in the Aviation Research Division. I will be working on system safety and aviation research. Some of what I’ll do is evaluate NextGen concepts. I interned one semester as an undergraduate as a propulsion engineer at Delta in their maintenance repair and operations (MRO) division. I hadn’t taken thermos yet, but I was able to work on one part of the engine, looking for ways to change its maintenance so there would be fewer failures. I saw that a lot of real-life work isn’t about the equations you learn in a textbook, but about your ability to break down problems. The whole experience showed me that I wanted to focus on material that would allow me to do higher-level thinking. It convinced me I should go to graduate school. As an undergrad I also did research on the space power grid with Dr. Komerath, and some more work with the FAA through ASDL. Dr. Sankar let me work with him on a CFD [computational fluid dynamics] project because I wanted to learn CFD. In grad school, I’ve worked on two main research projects: generating neural network models for NASA’s Environmentally Responsible Aviation project and formulating a safety assessment process for N+3 vehicles – that’s NASA’s NextGen vehicles. My job was to take two processes and put them in a web-based application that users could access online. Outside of being at Tech for the last six years, I’ve lived in New Hampshire my whole life, so I’m looking forward to moving to New Jersey. And I’m really looking forward to having my nights free. The big thing is, though, I’ll finally be able to make a unique contribution, rather than a class assignment. At ASDL, I learned new design methods – methods that were designed in the last five years. I feel like things I did at Tech will allow me to have an impact on the field. The research curriculum – especially with design. People come here from all over the world to get what we have, and they don’t know the half of it. 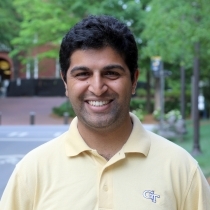 I feel that Georgia Tech gave me the skills that are valued by industry, especially with teamwork. We do a lot of work on teams, which is important in the workplace. And you can’t forget networking. At Georgia Tech, you meet a lot of sponsors who are running the industry right now. You know that you and your classmates could be running it tomorrow. Keep your mind open. What you think you want to do when you come to Tech might not be the thing that really excites you when you know enough. As an undergrad, after I took aerodynamic analysis, I started talking to professors about my interest in design. They started telling me about the multidisciplinary field of systems optimization, which was fascinating. And that’s where I began to specialize. The other thing is, there are still a lot of [knowledge/research] gaps in the [aerospace engineering] field, so think about how you can fill them. I’m talking about drones, cybersecurity, artificial intelligence. If you work hard, go to class, and keep your mind open, Tech can help you become a part of the future of aerospace. And if you look at it that way, you’ll make sure that you network with your peers – at Tech and at other top tier engineering schools – because we will be the ones ready to inherit leadership roles or become the hiring managers in the next five to 10 years.